The vanilla flavor of this coffee is irresistible and brings out the sweet aroma and premium taste of vanilla beans to give your coffee just the right amount of flavor. The smooth vanilla beans bring out the warmth of this roast. Flavored coffee beans are a nice treat that awakens the senses and leave you with peace. 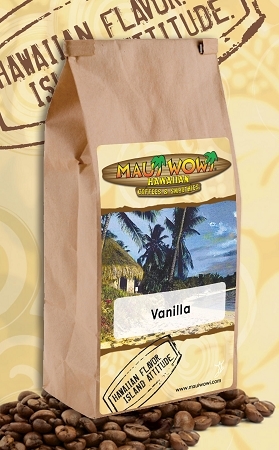 Like all of the Maui Wowi coffees, a bag of vanilla is freshly roasted and contains the highest quality beans to make it a premium coffee you can enjoy at home. Copyright Maui Wowi Hawaiian. All Rights Reserved. eCommerce Software by 3dcart.